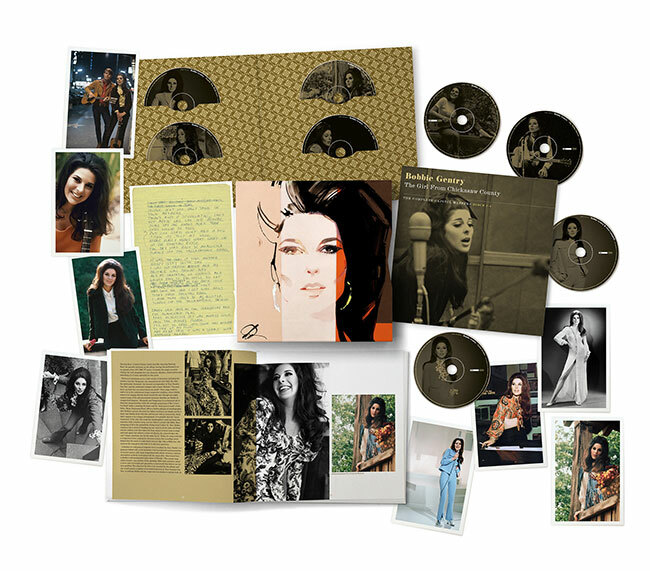 A career-defining deluxe eight disc boxed set spanning Bobbie Gentry’s Capitol Records years has been announced for September 21st via Capitol/UMe. The Girl From Chickasaw County – The Complete Capitol Masters features seven remastered studio albums from the original source tapes, and a wealth of rarities featuring seventy-five unreleased recordings including her “lost” jazz album, outtakes, demos, rarities and an eighth disc of live performances taken from her celebrated series for the BBC. Her disappearance intrigues us quite as much as what was thrown from the Tallahatchie Bridge: Why did she disappear? What has she been doing? Where is she now? But “Where is Bobbie Gentry?” is not the question we should be asking: Gentry was a trailblazer who was years ahead of her time; a successful writer, singer, musician, performer, producer, publisher, and businesswoman. What we should really be asking ourselves is “Who was Bobbie Gentry?” – The Girl From Chickasaw County provides more answers to that question than ever before, definitively re-appraising the musical legacy of this influential and iconic artist.